Home » How to Manifest » How Good Are You Willing to Let Life Get? 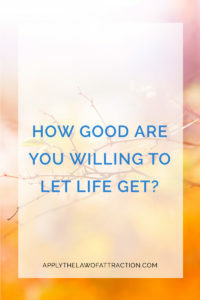 How Good Are You Willing to Let Life Get? A New Year is often seen as a chance to make a clean start in life. You look at the things you want to change and resolve that this year is going to be different. It’s going to be bigger, brighter, better! If you’re like most people, you make resolutions about what you’re going to do to make your life great. But how often have you really kept your New Year’s resolutions? Are they things that get you amped up and ready to go? Do you really get excited about going on a diet? I don’t create New Year’s resolutions. They aren’t the best way to make the Law of Attraction work. New Year’s resolutions can cause the Law of Attraction to fail because they often come from a place of looking at what is wrong with your life. Trust, self-love and gratitude are missing. A much more effective technique is to think about everything you want to happen and celebrate as if it has already happened. It's a bit of a cross-between the teachings of Neville and Abraham-Hicks, with a lot of fun thrown in. If you've ever watched Rikka's videos or taken one of her courses, you'll have seen how she celebrates as if too. It's normal for people to start off by looking at what didn't go well in the past year and what they will do to make the next year better. A lot of judgment can come up about what didn't go “right”, bringing you down to a low vibrational level that sets you up to fail from the very beginning. That's why I recommend you instead start by celebrating the past year. When you celebrate the past year, you’re automatically introducing heart energy and gratitude into everything that happened. You’re raising your vibration exponentially when you celebrate the opportunities that came your way, the person you have become, and the things you have done. Please don’t get skip this step because it really does make your vibration so much higher that the next step becomes very powerful in its ability to attract your dreams. Imagine it is a year from now. But here’s the key, imagine it as already done. If you write it down or tell it to anyone, write and speak as if it is already done. Have fun with it. Don’t hold back. Celebrate the big and the small. Stretch yourself! This exercise is powerful if you do it alone, but it becomes even more magnetic if you do it with your friends and family. I've been doing it with mine for a few years now! As we share the things we want to celebrate this time next year, everyone celebrates “as if”. We turn it into a party where we ring a bell to “ring in” everyone’s celebrations. We toast each other with champagne. We cheer each other on. You can have so much fun as everyone experiences their dreams. The feelings of excitement and anticipation generated by this exercise can produce fast results. It's a great idea to write down what you want to celebrate this time next year. Rereading them daily helps you to stay in the feeling of celebrating as if. Love and look forward to all of your articles!